Once upon a time, a woman was not considered “dressed” unless she wore a hat. 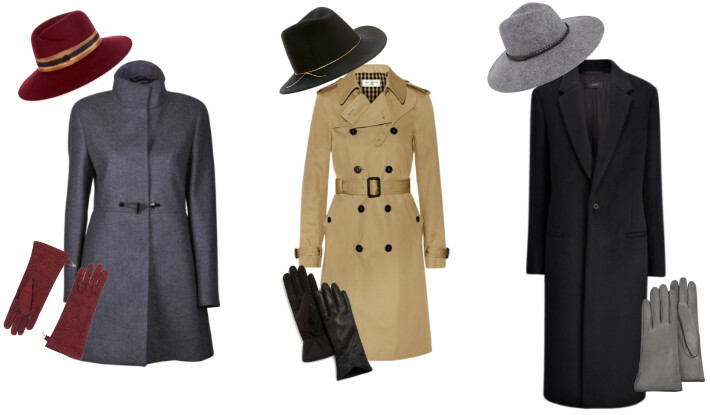 Today, hats have largely fallen out of fashion – except when then the weather calls for it. When temperatures dip and you need to bundle up, a hat becomes a necessity. While you can go hatless – as many people do – you’ll be more comfortable and last longer outside if you’re covered from head to foot. So what kind of hat should you wear? It depends on what you’re doing. Like clothing, hats are considered formal or informal depending on what they’re made of, which then dictates what type of coat they should be worn with. 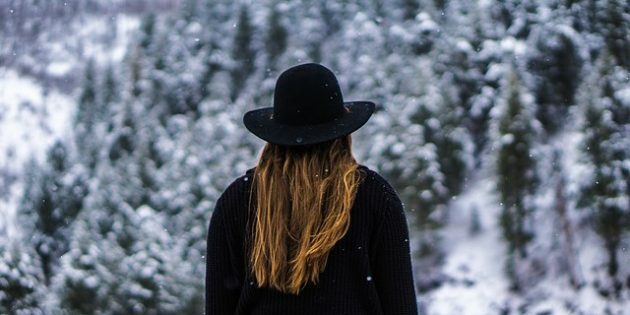 If you live in a cold climate and have several types of coats, it makes sense to have several types of hats with which to pair them. Crowned hats like fedoras and wide brimmed hats are considered more formal than soft top hats like berets and stocking caps. Hats made of thin, stiff, felt are considered more formal than those made of soft materials like knitted wool, acrylic, or fur. Hats that cover the ears are considered less formal than those that leave the ears bare. Felt hats with accents like flowers and bows are inappropriate for work but perfectly acceptable for social gatherings like weddings and parties. Soft, knitted hats with accents like pom-poms and fringe are considered casual and inappropriate for use with most business attire. Bright colors like orange and neon green have “safety” associations because they’re meant to stand out. Hunters and road construction crews wear orange so they can be easily seen, and extreme winter sports enthusiasts wear neon colors like yellow, green, and blue so they’re easier to find in the snow by search and rescue crews if they happen to get lost. So unless you’re hunting or participating in extreme sports, avoid neon hat colors. Dark and earth tones like black, gray, brown, etc., are considered more formal and are most appropriate for work. They can also be worn after hours. Non-neon colors like red, blue, and purple can be worn to work, depending on what they’re paired with, but the emphasis should always be on function instead of fashion in the workplace. You have much more leeway after hours. With these guidelines in mind, let’s look a some popular women’s hat styles. 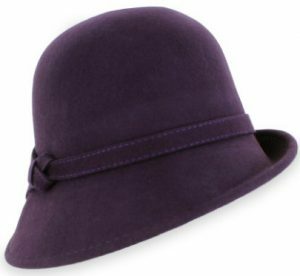 Wool felt wide brim hats have a flat crown and wide brim. They can keep the winter sun out of your eyes and the snow off your face. Just be sure to shake off the snow once you reach your destination so the hat can dry quicker and hopefully not lose its shape. Pork pie hats have a narrow brim and a flat or slightly domed crown with a crease running around the inside top edge. Introduced in the 1830s, pork pie hats usually featured feathers or other ornamentation. Today, a ribbon or band is standard. Fedoras have a medium brim and indented crown, which is typically creased lengthwise and “pinched” near the front. Introduced in the 1890s, this style has been popular with both men and women ever since. Like the fedora, a trilby is typically creased lengthwise and “pinched” near the front. But it has a shorter brim than the fedora, and the back brim is typically curled up. 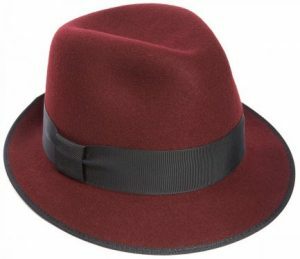 The trilby was also introduced in the 1890s and has gone in and out of style with men and women ever since. Pronounced klosh – the French word for bell – this style has a rounded crown and echoes its namesake by fitting closely to the head and flaring slightly with the brim. Made popular in the 1920s, cloches typically cover the ears and sit low on the forehead, just above the eyes. 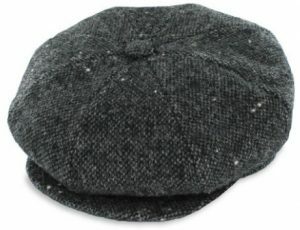 A flat, rounded cap with a small, stiff brim, the newsboy first became popular in the 1890s. 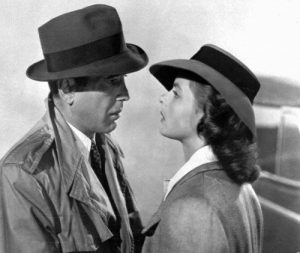 Though traditionally a male hat, women have been wearing them for decades. 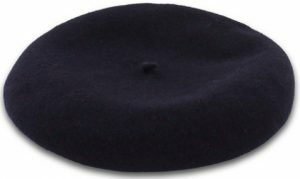 A flat, brimless cap with a close-fitting headband and often, a tab at the center, the beret can be shaped in a variety of ways. It originated with French farmers in the 18th century, but is now part of many military uniforms world-wide. Berets are popular with both men and women. 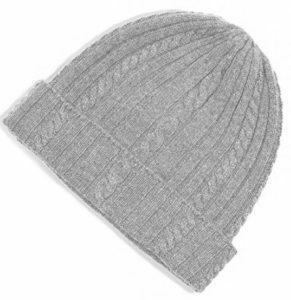 Knitted in a round, symmetrical shape, beanie cap styles vary from either fitting snugly against the scalp or being loose and piled atop the head. Either way, it’s designed to be pulled down over the ears to keep them warm. As with other accessories, winter hats should reflect the formality level and mood of the clothing and coat with which they’re worn. So if your clothing and coat are very casual and are geared for warmth or winter sports, a beanie cap or ski mask would be appropriate. So would insulated mittens or gloves. 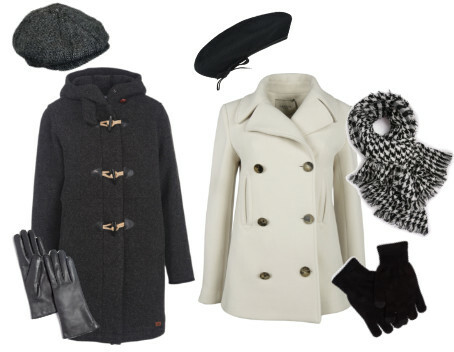 The next level up might be a toggle coat or pea coat, which might call for a beret, newsboy, or cloche. These would be appropriate for weekend or after hours, or if you work in a casual environment. Pair them with knit or leather gloves. 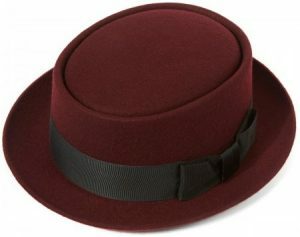 The most formal hats are fedoras, pork pies, and wide brimmed felt hats, which you would then pair with more formal coats like trench coats and overcoats. These are appropriate if you work in a formal environment, or if you’re attending a formal event. Wear with leather gloves. So why is it important to match the formality level? It’s all about looking schooled and pulled together. If you look as good during your commute as you do once you get to the office, it makes you look like you’ve put some thought into your outerwear wardrobe – which you have. It lends a sense of authority. As opposed to grabbing whatever you happen to have on hand on that first cold, snowy day and just heading out the door looking rushed and unprepared. You don’t want that. Often, women try to make one coat and one hat work for all situations, whether they’re shoveling snow, going to work, or attending a dressy evening event. Frankly, that’s difficult. 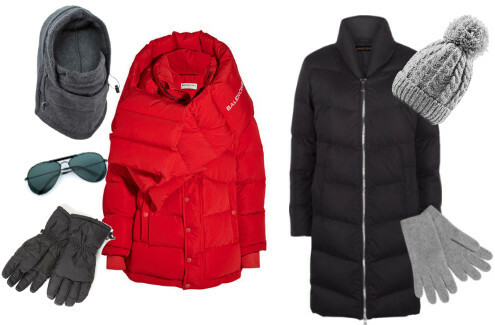 Unless you live in a part of the world that rarely sees cold weather – like the tropics or subtropics – it’s smart to build an outerwear wardrobe that caters to a variety of activities. That way, you look good whatever you’re doing. So take some time and try on some hats and flush out your winter hat and coat wardrobe. Your goal is to have enough options so that you can stay warm and look good regardless of what Mother Nature throws your way. Need some help putting together a polished, consistent image, regardless of weather? This resource can help. Very interesting topic. What About seventies hats, with a large, slightly wavy brim? Can they only be paired with boho style clothing, or do they also go with more classic coats? Those types of hats can be worn with classic coats that have rounded details like ruffled sleeve cuffs, fur collars, asymmetrical hems, and the like. 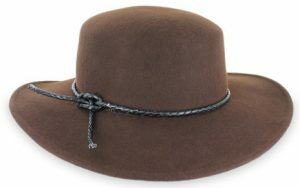 In Australia, some wear a cowboy style hat in the heat of summer (named an akubra). The shade is needed from the wide brim and the working environment. I read a statement from our cancer society that the rate of hat wearing is dropping, that is so worrying. I wear an olive akubra on the school runs and often get looked at – a straw hat just doesn’t cut it with my fair skin unfortunately. I found a picture of the Duchess in my hat! She is wearing it in winter with a shearling coat and boots, so it is appropriate for winter too (I didn’t make that very clear in my previous comment). I rarely wear a hat of any type. With very fine hair, I will have hat hair all day. Consequently, I prefer a scarf around my neck and earmuffs, but I only wear the muffs on extremely cold days. It comes down to a trade off — hat hair all day or earmuffs which are not as formal as I would like for business. Which would be your selection? Hi Janet – oh, hat hair! It’s one of the biggest reasons hats fell out of favor in the 1980s, when “big” hair was all the rage. The easiest way to combat it is to style your hair in a hat-friendly way, like straight, a low ponytail, a partial pull back, or a low chignon. In short, put fullness somewhere other than the top of your head, which will be impacted by a hat. The Duchess of Cambridge is brilliant at this. Google “Kate Middleton winter hat” for some ideas. Interesting. Now I have a hat in a soft, black imitation fur. It has a small brim. Sort of like a pork pie, but flexible. I love this as it looks good and is warm. But I can’t fit it into this list. Where would this go in the list? 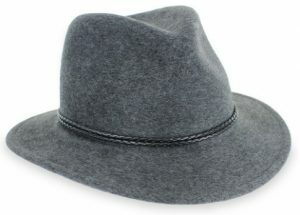 Hi Ekaterin – because of the pork pie shape but soft, flexible material, I would put it in the casual to semi-formal category, meaning you could get away with wearing it with both pea coats (casual) and overcoats (formal) since thick fur hats are often worn with formal winter coats in very cold climates like Russia and Scandinavia. Wear leather gloves with formal coats. It all sounds very nice, but I live where for the past month the temperature has been -30 Celsius (about -20 fahrenheit). Would you adjust the formality to adapt to the temperature, if you were going to Church? Would you cover you ears? Hi Dawn – Yes. While covering the ears is considered less formal, sometimes you just HAVE to in very cold climates. Some felt hats come with ear flaps that tuck up into the crown when not in use. Others, like a cloche or fur/faux fur styles, cover the ears as part of their construction. There is some leeway here, but you don’t want to wear an informal hat with a formal coat, or informal outerwear with formal clothes. Obviously, it can be done – and often is – but you create a more polished look if your formality level is consistent with attire, accessories, and outerwear.